While we’re prepping for the Detroit Auto Show over here, the 2018 Tokyo Auto Salon is underway. If you’re in the area, you should make a beeline for Subaru’s booth, because there is some truly awesome stuff there. In addition to the Viziv Performance STI Concept that crowns the exhibit, Subaru is also trotting out some bitchin’ race cars and classic rally cars. Let’s take a virtual walk, shall we? You’ll be able to see the famed 1993 Subaru Legacy RS that ran won the New Zealand Rally with Colin McRae behind the wheel. Then there’s a Levorg STI Sport, a weird but awesome wagon that Subaru’s in-house tuner, Subaru Tecnica International, developed in 2016. Do they sell this thing in Japan? Of course they do. Do they sell it here? LOL WHAT DO YOU THINK? And then there’s Subaru’s entry for the 2017 Super GT Series, the BRZ GT300. I have never seen a BRZ look this awesome before, all flattened out, with holes cut into its body and flares everywhere. It’s not often you get to see displays like this, even at an auto show. Sometimes, on media days, you’ll get a rare treat of seeing the vintage or really special motorsport stuff. But even that’s unusual. I’m not there myself, though I wish I were. If I got the chance, I’d take as many opportunities as I could to stick my head in those cars and smell them. That’s one thing that never translates over from photos or video. 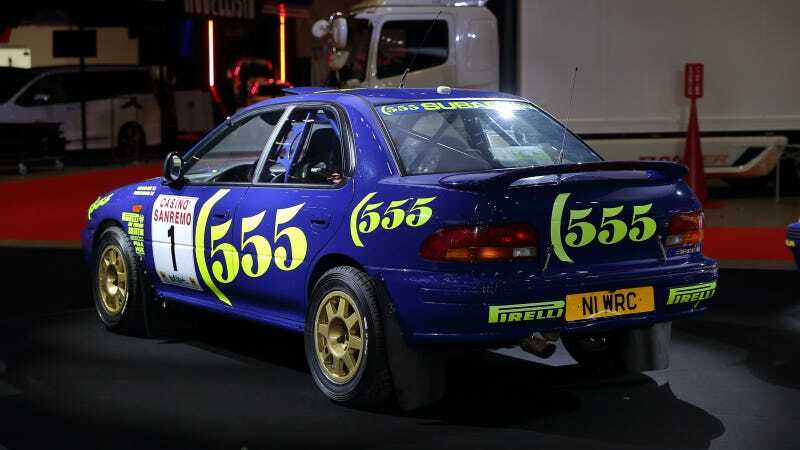 First place went to Colin McRae in this, a Subaru Legacy RS prepped for the World Rally Championship. It’s just like your winter beater now, but wildly better in every single possible way. This was the car that claimed Subaru’s first WRC victory. Another first place win for Subaru in the 1996 World Rally Championship season with McRae as the lead driver. This is like your other winter beater, but better in every single possible way, if you’re even fancier. It’s Colin McRae’s race car, dammit. Look at the ones for sale in Australia. They’re actually not a bad deal, and what you get in return is essentially a Subaru Legacy wagon, with the addition of a 264-horsepower engine out of the regular Subaru WRX. Plus some sporty bumpers and everything. It’s a great looking car, too. And then Subaru gives it a CVT. Only. Despite looking so wonderful, reviews indicate the Subaru Levorg STI Sport is merely thoroughly okay. The S208 is a special edition Japan-only STI. Instead of the turbocharged 2.5-liter boxer engine that we get here, the S208 has a tuned, turbocharged 2.0-liter that puts out 324 horsepower. It’s also got the name of an engineering technical manual, as a feature. Japan-only, kids. But no performance upgrades, just new dampers, brakes and wheels. This race car participated in the Nürburgring 24-Hour Race, running in the SP3T class for turbocharged cars up to 2.0-liters. It’s like your WRX now, but we don’t need to repeat that it’s better in every possible way than yours, because it’s a race car. But we will. And everything is blue! Blue is good.